This case delves into how aesthetic treatments like closing a diastema can be huge game-changers for patients with low self-confidence. Jennifer came into my office with a terrific personality but a smile she had been self-conscious about her whole life. 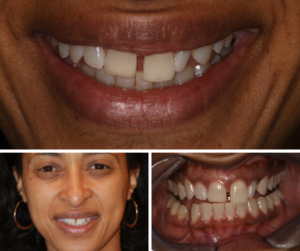 With a very large diastema, she avoided smiling. We discussed treatment options including adult ortho until we settled on an avenue she preferred. Jennifer opted for a two-visit smile enhancement that included 10 Empress All Porcelain veneers and laser gingival recontouring. In addition to the diastema closure, we needed to address the midline discrepancy, which was worked out in the diagnostic wax-up. We chose a 040 body shade with a warmer cervical shade of 110. Gold Dust fabricated #4-13 from an Ivoclar IPS Empress Esthetic E TC 0 ingot with stunning results. These were bonded in with Variolink Veneer System 0 cement. Post treatment, Jennifer was equilibrated and her bite was balanced using the T-Scan to ensure an optimal occlusal scheme. The patient was thrilled with her post-operative smile. It became instantly broader and more confident. How does giving self-confidence to a patient inspire you? We’d love to hear from you in the comments! 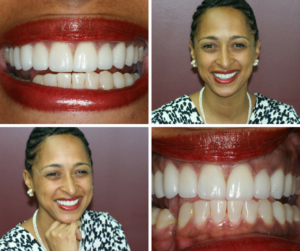 And don’t miss out on the previous Case of the Month, where Dr. Booker completed a restoration for discolored teeth.